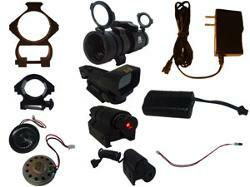 Accessories - The Latest Innovation In Outdoor Laser Tag Equipment Take Advantage Of Our 14 Day Trial Program! All customers, new and old, in need of repairs rest assured, I can fix most issues with your Ikon-x laser tag guns and equipment, but some things you may be abke to replace yourself such as speakers, emitters, sensors and batteries. I have DIY YouTube videos (below) on how to change those parts. But some parts you will need to ship to me for repair. You can either ship the whole gun to me or use the videos below to see how to remove parts and ship those to me (this way saves you money on shipping cost). After I repair or replace your part I will send you a Pay Pal invoice via email, including shipping cost, and once payment is made I'll ship out your repairs. I'll send you the shipping tracking number shortly after through email or text. So if you need repairs email me at info@ikon-x.com with your name, phone number, how many guns or items need to be repaired and a brief description of what is wrong with your guns. Or you can text me at (818) 266-7742 with the same information. I will then reply with the address for you to ship them to. Make sure to send your equipment to me with a tracking number. Turn around time will depend on how busy I am with prior customer orders and/or repairs at the time I receive your equipment. So please plan to be without your equipment accordingly. Of course I will try to get your equipment back to you as quickly as possible.